The Battle Agency is the newest facility added with Festival Plaza. 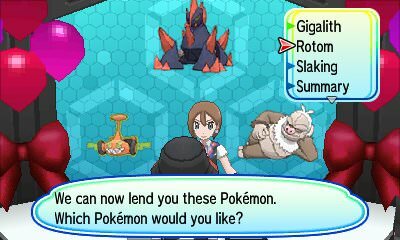 This facility is a lot like what the Battle Factory was back in the Hoenn and Sinnoh Region, allowing you to rent various Pokemon in order to use them in a Single Battle. However, in the Battle Agency, you will only be allowed to select one of three Rental Pokemon. The second and third Pokemon you will need for your battles will come from recruited players you have interacted with in Festival Plaza. In essence, the more players you have interacted with inside Festival Plaza, the better rang of Pokemon you will receive. As you continue to battle within the Battle Agency, your Grade will continue to increase. As you do, you will receive Festival Coins. If you increase a Grade after a battle, you will even receive a Rare Candy. Should you battle a Boss Trainer (including the likes of Sophocles & Giovanni) and win, you will be rewarded with a Gold Bottle Cap. You will also be awarded with five Festival Coins no matter if you defeated or lose to said Boss Trainer. As you increase in Grade, the Level of your Pokemon and your opponent's Pokemon will increase as well (maxing out at Level 100 at Grade 50). Because of this, it wouldn't be wise to recruit players from lower Grade Levels, as it could give your opponent the edge in leveling. Higher Grades will also see Weather/Terrain Settings included within battle. Should you not become happy at any time with Random Pokemon Selection you are given at the Battle Agency, you can change them by what is being called the Switcheroo. Within Festival Plaza, you will find the Switcheroo Facility. This facility will allow you to randomly shuffle the three Pokemon you have as your Main Pokemon, all at the low, low cost of ten Festival Coins. The better star ranking of the Switcheroo Facility, the more you can change the Pokemon in a day.